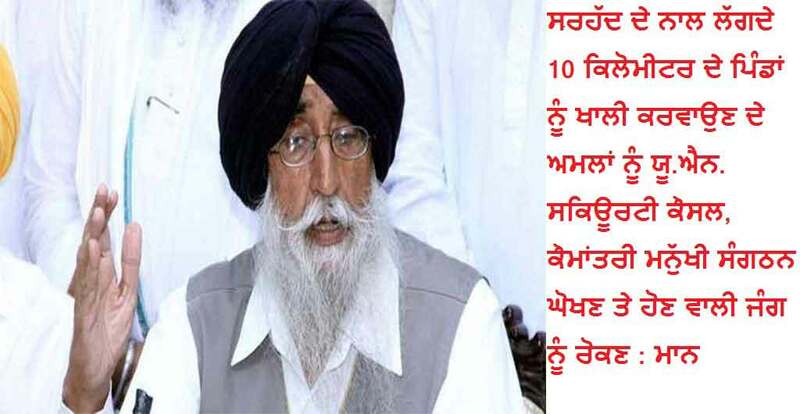 Shiromani Akali Dal (Amritsar) Thursday said that it does not stand for war against Pakistan or China. “Our party will not support even a hot chase into another country’s territories. THIS (Theocratic Hindu Indian State) has become bold, haughty and audacious after its defence and security treaty with USA. The ball is now in the court of the US to stop any rash and adventurist incursions by the Hindu state into other countries territories,” Simranjit Singh Mann, chief of Shiromani Akali Dal, said in a statement issued this evening. “Our party is also against tempering with the Indus Water Treaty (IWT) of 1960, though we are against it as formulating and making the treaty, Punjab state was not an invitee or a signatory to it,” Mann added. “If the Hindu state tempers with this treaty, then China which is an ally of Pakistan, the former will divert the waters of the river Sutlej whose source is in Tibet China. This will affect the flow in the Sirhind Canal whose waters irrigate the farm lands of Malwa. The decrease in the flow of the Sutlej River will also be insignificant for the Bhakhra Canal that irrigates the fields in Haryana. The extra discharge of river Sutlej will affect the canal system that originates from Harike head works and Hussainiwala head works, both of which carry waters for irrigation in the parched farmlands of Rajasthan,” Man explained if IWT is touched. Spanish Women Speaks Out To Support Sikhs.